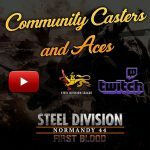 Back to Hell, the second DLC for Steel Division: Normandy 44, will be available today at 3PM CET, and will feature 4 new divisions, 2 exclusive ace models, as well as 7 historical missions, including 5 in cooperative play. Let’s focus today on the rag-tag forces charged with preventing Paris from falling to the Allies or, barring that, to burn it to the ground: the Festung Groß-Paris. But in the Summer of 1944, while the Mortain counter-offensive was on its way, Hitler ordered Paris to be held at all cost. For this task, he selected General der Infanterie Dietrich von Choltitz, a man of both unfailing bravery and blind obedience. An Eastern Front veteran, he had never questioned orders, even when it came to assisting Einsatzgruppen in rounding up and executing Jews. Later transferred to Italy, he faced the Allies at Anzio before commanding a corps in Normandy. Barely two weeks after the July 20 plot against Hitler in which the previous Governor of Paris had been involved, and at a time when Wehrmacht officers were regarded with suspicion, von Choltitz was still deemed trustworthy by the Nazi leadership. When appointed as Military Governor of the Paris on August 7th, 1944, he was explicitly ordered by Hitler to burn the city to the ground instead of letting it fall to the Allies. The core of the garrison was the 325. Sicherungs-Division, a security unit made up of Landesschützen, reservists too old or unfit for service in a more active division and usually used only to hunt partisans. 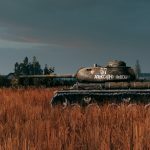 Lacking motor transportation (they often moved on bicycles), heavy equipment such as artillery and Flak, and with only light anti-tank guns and captured armored cars of its own, it stood no chance against Allied tanks. The other main component of the garrison was Sperr-Riegel Paris, a defensive ring defending the outer accesses of the capital and formed around Flak-Brigade 1. It served all kind of equipment, from Flak trains to French AA guns captured in 1940 … or for some personnel, no gun at all. As for armor, the Governor of Paris could rely on Panzer-Kompanie Paris, a security and training unit made up of outdated Panzer I, Panzer 35R(f), … and a few Panzer B2(f), including flamethrower ones. 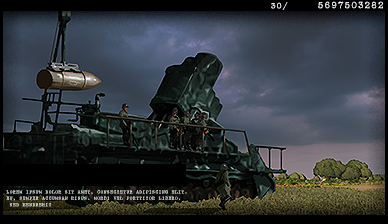 Near Melun, another armored company entirely equipped with Somua S-35 was protecting the Southern approach to the capital. 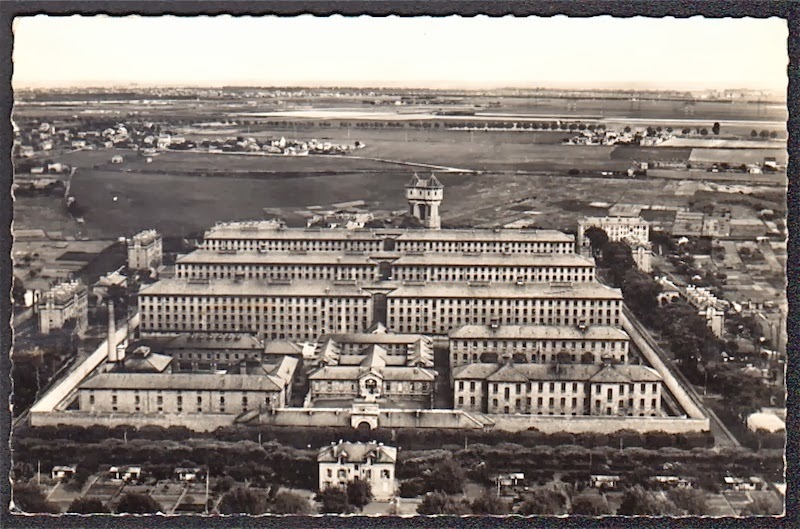 Within Paris itself, von Choltitz could tap into a large pool of soldiers from staff, training or supply units, both from the Wehrmacht, Kriegsmarine & Luftwaffe. But many of those where just desk soldiers with barely basic training and absolutely no combat experience, and for most of them no wish to gain any. Another pool of “volunteers” whom nobody asked what they wished for were Bewährungstruppen (meaning “Redemption Unit”, penal troops). Feldgendarmerie and Feldjäger units were active within the defense perimeter to keep soldiers in line and provide cadres to ad hoc units. Yet the Governor had a few aces in his sleeve. Literally. 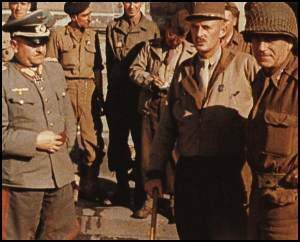 A few individuals, or small units, from divisions retreating from Normandy were still in Paris when von Choltitz took command and therefore fell under his authority. 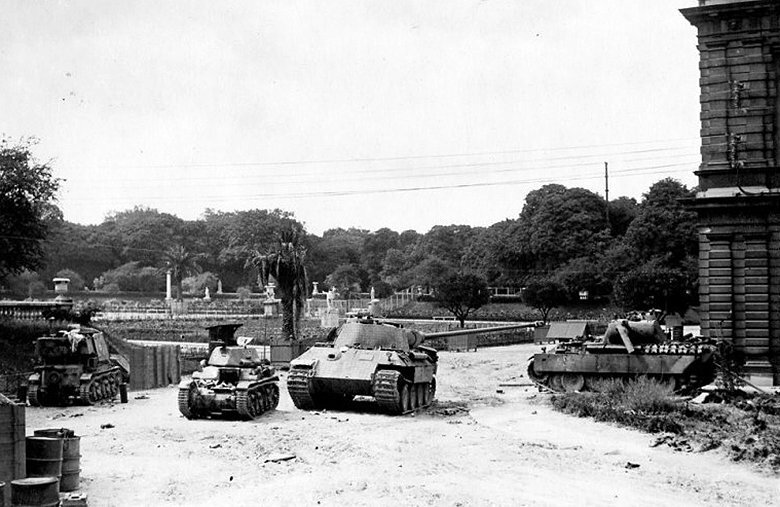 A handful of Tigers, Hummel, Puma, Jagdpanzer, … often delayed in Paris’ workshops for repairs, as well as a dozen Panthers, were still in the capital. Those were crewed by battle-hardened survivors returning from Normandy, mostly from 21. Panzer and 1., 2. or 12. SS-Panzer. 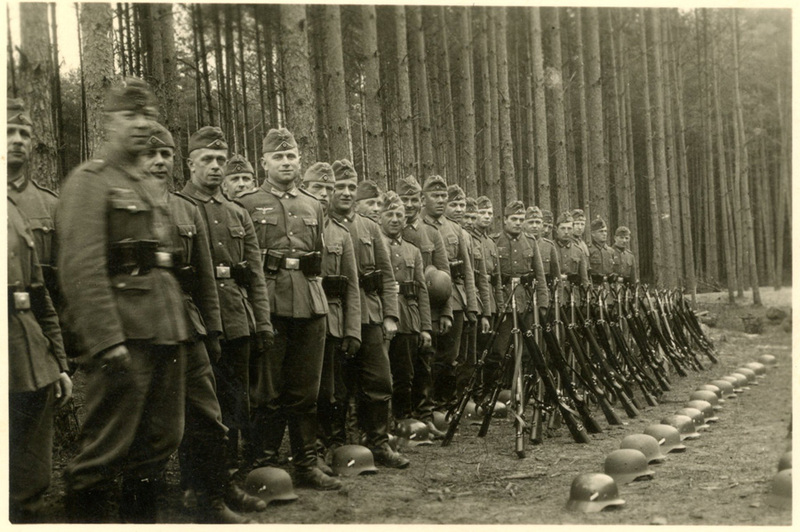 An entire Panzergrenadier company from 2. 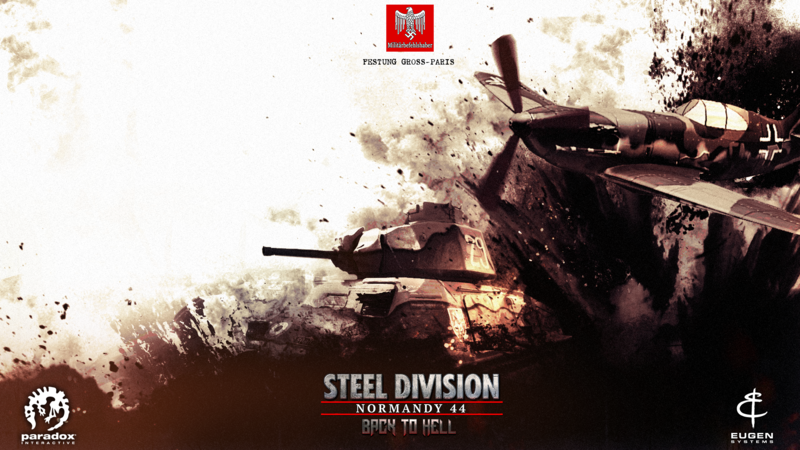 SS-Panzerdivision “Das Reich” was in Paris to bolster the defense, as well as another from the R.O.A. (aka Vlassov’s Army) … yet the latter spent most of the battle of Paris executing partisans (or suspects of being) jailed in the city prisons. As a military governor, von Choltitz also had control over the local Luftwaffe units. Not only Flak or field units but fighter squadrons too. There were about sixty planes stationed around Paris, mostly from home defense squadrons of which many were flying captured French D.520 Dewoitine. To wipe Paris off the map if needed to, he was also granted command over an entire bomber Luftflotte. 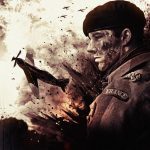 And finally, the cherry on the cake … As a veteran from the siege of Sevastopol, von Choltitz had witnessed first-hand the devastation wroke upon the city by the (600mm!) 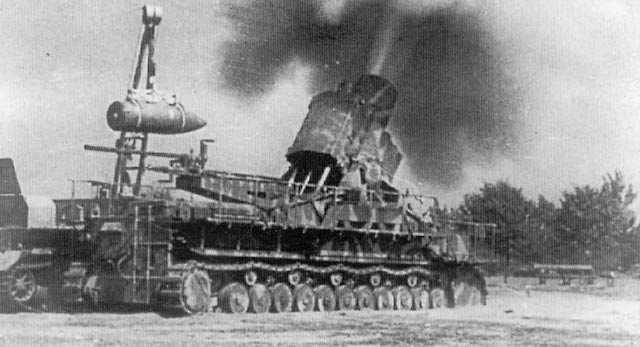 super-heavy mortar Karl Gerät. 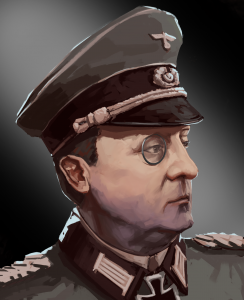 During his meeting with Hitler in Rastenburg, when ordered to destroy the city, the new Governor expressed the wish to have one under his command. A wish granted by the Führer, which transferred one of those massive guns from the East. Fortunately, it didn’t reach Paris in time to play a part in the battle and only fired a few revenge shot against the city after its liberation before being chased out of range by the Allied advance. While von Choltitz was taking command of the city defense, the Parisian Résistance was growing more active with the news of German defeat in Normandy. But while the Résistance had stood united before the Allied landings, political rifts between the various groups, especially Communists & Gaullists, were now surfacing again. 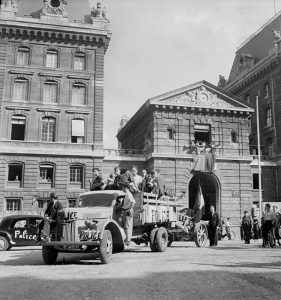 The former wanted a popular uprising which would give them more legitimacy in post-war France than owing the liberation of the capital only to foreign allied forces, while the latter would rather wait for a “quiet liberation” by regular forces and not expose the city to destruction. Between August 10th & 19th, subway, railroad & post office (which by then controlled the phone lines) employees went on strike, hampering the German movements and communications through and around the city. Fearing (with reason) that policemen & gendarmes, the only regular troops in France to still bear arm, would join the uprising, von Choltitz ordered them disarmed. That decision immediately threw both those forces on the strikers’ side. By August 18th, the strike was general and the Résistance’s leader in Paris, Rol-Tanguy, called for the general mobilization of all volunteers. 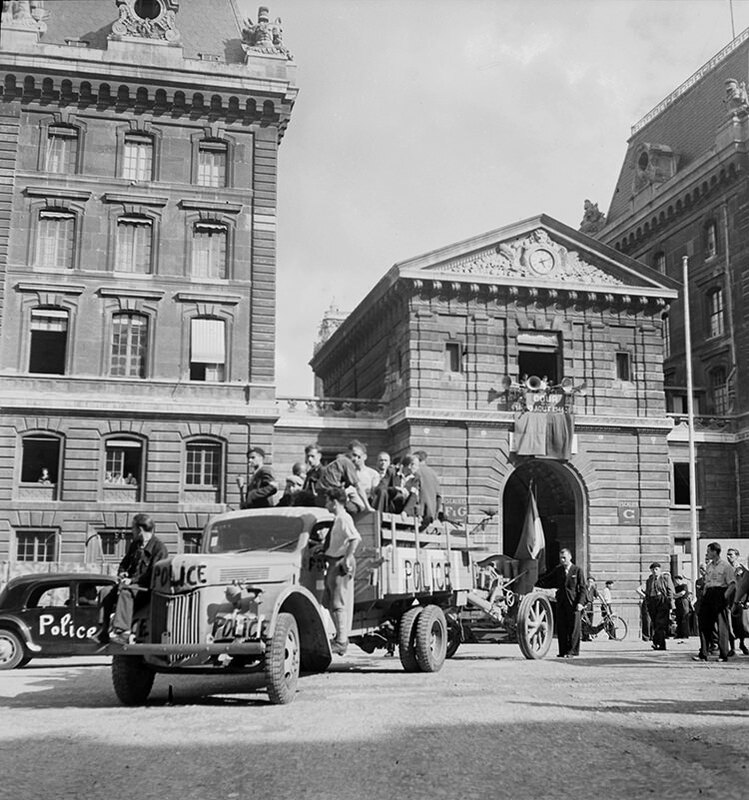 On August 19th, 2.000 lightly armed policemen barricaded themselves in the Paris Police Prefecture and rose the Tricolore above the building, kicking-off the uprising. 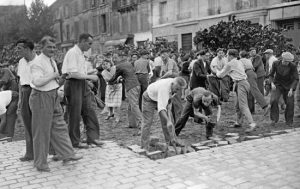 Paris had a long tradition of uprisings (the term “barricade” was even coined by the “Day of the Barricades” in 1588) and soon thousands of Parisians of all ages, like their forefathers (and as will again their children in 1968! ), turned every street and block into small fortresses. Makeshift barricades built from road cobblestones, carts, sandbags and every furniture people would throw out of the windows, especially mattresses. It is to be noted that Paris’ modern urban architecture, with its large boulevards and star-shaped road junctions, was actually designed by Baron Haussmann to, among other things, easily quell such uprisings, allowing the more heavily armed troops (loyalists) with cannons to demolish barricades and their defenders from afar. 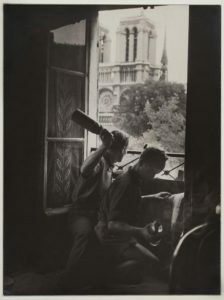 But unlike the Warsaw Uprising, the Paris Uprising barely had a few weapons and not even a radio to contact the Allies. While the Germans could hardly drive a truck through Paris without being blocked by a barricade or taking shots from snipers, the Résistance couldn’t really bring the fight to them. August 19th was a strange day in Paris with both sides watching the other and skirmishing at best before a truce was agreed later in the day. For von Choltitz, it was meant to consolidate his positions while waiting for the reinforcements he was asking (or just the troops he had been promised) to arrive or consider the evacuation of the city in the worst-case scenario; for the Résistance, it meant winning time for the Allies to send help. Rol-Tanguy had dispatched his chief-of-staff, “Gallois” on a dangerous mission to cross the frontline between German & Allied lines, and inform the latter about the uprising. And if they refused to help, to convince Leclerc in person to go rogue and rush to the rescue even against orders. Upon learning about the uprising, Eisenhower was still unwilling to change Allied plans to help the city, but De Gaulle was adamant that he would not let the French capital suffer the fate of Warsaw, and would personally order Leclerc to go if he had to. Having promised De Gaulle, back in Algiers in 1943, that Paris would be liberated by a French unit and knowing that the 2e DB would rush toward the capital with or without his order, and surely unwilling to sacrifice the Parisian population, Eisenhower finally gave his blessing. 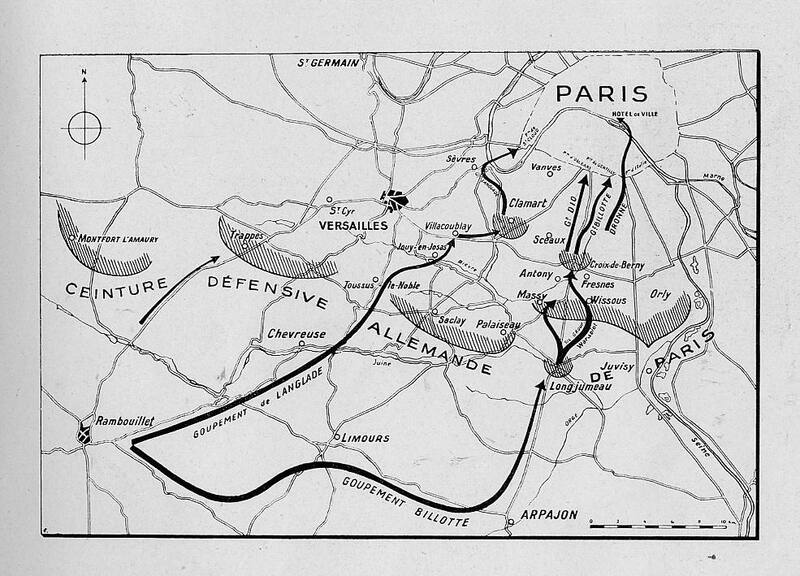 On August 22nd, Bradley ordered the 2e DB & US 4th Infantry Division to dash for Paris. 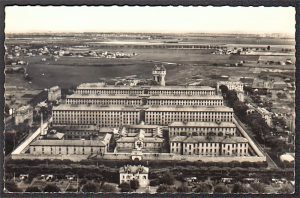 On the morning of August 25th, at Fresnes, home (still today) of the second largest French prison, the German military inmates imprisoned there were freed from their cells and formed into Bewährungstruppen (penal units) to defend the very jail they were locked in earlier in the day! Protecting a 88mm Flak gun (and not a PaK 40 as depicted in “Is Paris burning?“) and some lighter guns, they engaged the five first Shermans to show up, managing to destroy the “Marne“, damage a second one and stop two others before being rammed from the rear by the last one, which had smashed through garden walls to appear behind it. Meanwhile, in Paris, the truce was seldom respected by the Parisians, many of them unaware of the negotiations at the top. On the other side of the fence, the hated collaborationist Milice knew it had nothing to lose and both sides exchanged shots whenever they met. Combats increased in violence in the following days, reaching their peak on 22nd, the same day the 2e DB started its dash toward the capital. Fighting centered especially around governmental buildings (Senate, City Hall, …) which the FFI tried to take control of. The next day von Choltitz, who so far had been trying to negotiate a cease-fire with the Résistance, sent tanks and infantry against the Grand Palais which the FFI were holding. At 8 AM, at least five tanks, including some Panthers and maybe Tigers, a captured French 25mm rapid-fire gun and numerous infantry surrounded the building and opened fire on it. 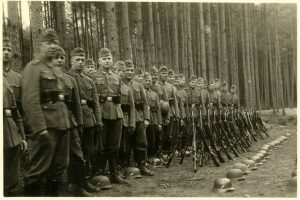 In the following hours, several attempts were made by small groups of policemen to reinforce the besieged defenders but all were beaten back with casualties by the Germans. Around noon, the FFI were still holding, although only armed with rifles and light machine-guns, when they were puzzled by the appearance of a little strange tracked vehicle moving in their direction: a German officer prisoner in the Palais with the FFI immediately identified it as a Goliath remote-control explosive and warned everybody to take cover. 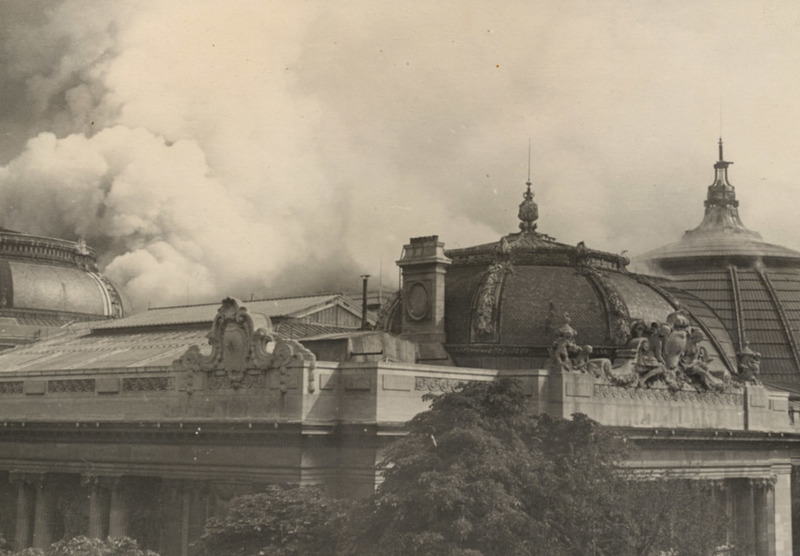 The Grand Palais‘ doors were blown open and a fire spread in the building, throwing into a panic … the horses, elephants, tigers, and panthers from a nearby zoo which had been brought inside at the beginning of the uprising to protect them! With fire spreading & wild animals on the lose, the position was untenable: the defenders finally surrendered. On the testimony of the German officer whom they had held prisoner during the combat that he had been well-treated, the Germans exchanged them with some of their own men captured by the Résistance. Everywhere, von Choltitz’s crackdown was violent, with tanks being directed against major buildings held by the FFI who, for the most part, had no anti-tank weapon. Yet, the Germans lost several armored vehicles, most of them disabled by “cocktails Joliot-Curie”, the French counterpart to the “Molotov cocktail”: mixing sulfuric acid with gas, it was easier to handle than a Molotov because it didn’t require to be lit before being thrown, the mixture taking fire automatically when the bottle broke. This was the invention of Frédéric Joliot-Curie, 1935 Nobel Prize for Chemistry with his wife Irène (herself the daughter of the famous Marie Curie). At the beginning of the war, Joliot-Curie had been the man who made sure France secured all the world’s reserve of heavy water (produced only in Norway) and smuggled it to Britain with all his collaborators working on the atom during the Fall of France, under the nose of the Germans. He himself remained in France and joined the Résistance. During the Paris Uprising, Joliot-Curie and his assistants had set shop in the Police Prefecture’s basement where they relentlessly prepared their “cocktails” and home-made explosives to supply the defenders. After the war, he would lead France into the atomic age. 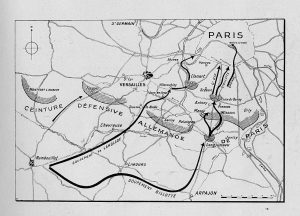 The Germans seemed to be retaking the upper hand and about to wipe the Résistance, but that same evening, the 2e DB entered Paris from the South. Unbeknownst to von Choltitz, it was still only capitaine Dronne and his small band of Nueve Spaniards, a dozen vehicles at best, but the news spread in Paris like wildfire, both raising the morale of the Parisians and taking the Germans by surprise, who stopped all attacks and withdrew to their strongholds. Yet the core of the 2e DB wouldn’t arrive before the next day, August 24th, with the US 4th Infantry Division following closely. From besiegers, the Germans became the besieged, with thousands of FFI surrounding each German-held buildings: knowing their chance of survival were higher if they surrendered to regular troops rather than insurgents, the Germans held their positions wherever they could until attacked by 2e DB or American units, then laid down their arms. Von Choltitz himself, trapped into his HQ at the Hôtel Meurice, surrendered on August 25th without giving the order to detonate the many explosives set on Paris’ historical buildings, as Hitler had ordered him to. But not all surrendered that easily though, especially in the Senate where Oberst Berg and some 600 die-hards, including a large part of SS troops, refused to give up. Supported by tanks, including Panthers and Beutepanzer, they repelled several attacks, even after von Choltitz’s surrender. Finally, it took the menace of Commandant Crépin, commanding the 2e DB‘s artillery, that any man still bearing arms despite the garrison’s capitulation would not be considered a prisoner of war, and therefore shot, to force the to lay down their weapons. The 2e DB had suffered heavy losses on its way to Paris, but those were replaced tenfold in the next days, the division even creating new companies to accommodate the many volunteers. As for Paris itself, it suffered for a few days from the Hitler’s wrath, which couldn’t stand that his order hadn’t been carried out: he ordered the Luftwaffe to bombard the city, but the bombings were restricted to the suburbs. The super-heavy mortar Karl Gerät, arriving too late, managed to fire a few rounds on the capital from afar before being forced to retreat in the face of the Allied advance. Von Choltitz joined other German high ranking officers in captivity in Trent Park country house, which unbeknownst to them was bugged by British Intelligence, listening and recording their every word. There, von Choltitz was very critical of Hitler and unreserved regarding the German officer corps’, and therefore his own, responsibility in the war crimes committed in the East. Whatever his reasons to spare Paris though, it paid off. Thanks to French support, von Choltitz never went on trial for his crimes in the East despite his self-acknowledgment of said-crimes at Trent Park. He was released in 1947 and died in 1966 in Baden-Baden, then in Germany’s French occupation zone. Several high-ranking French officers attended the funeral of the man who, by a strange twist of fate, had managed to style himself the “Savior of Paris”. 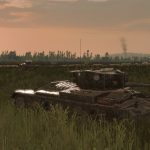 The Festung is a rag-tag battlegroup, bringing together the worst and best of the German army. A mostly infantry “division”, centered around the poorly equipped 325. 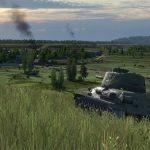 Sicherungs-Division, it nonetheless features some elements usually restricted to armored divisions. a LOT of infantry slots (the max actually), with choices coming in many shapes and size, from older Landesschützen to elite ‘Das Reich‘ Panzergrenadier, with Bewährungs. penal squads, Feldgendarmerie, Kriegsmarine or Luftwaffe desk-soldiers or even Russian R.O.A.! 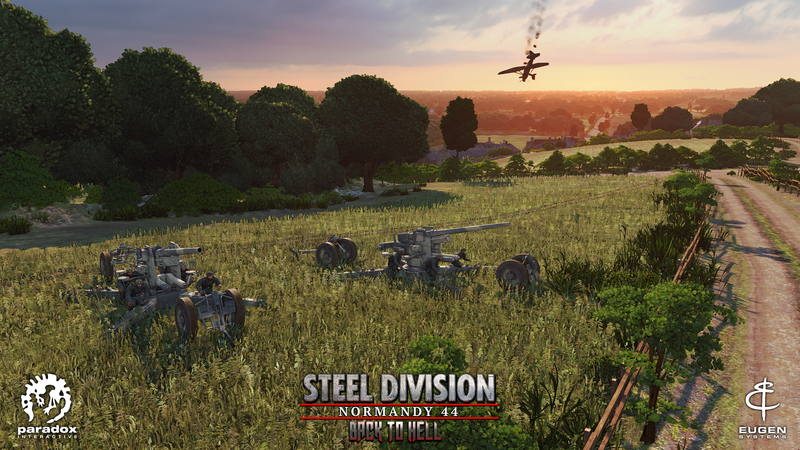 its anti-air tab features two new guns, both captured from the French in 1940: the Flak 39(f) & Flak M36(f), respectively 25mm & 75mm. its tank & anti-tank tab offer a lot of choices, but light/obsolete stuff come in number when the good stuff is usually one per card. 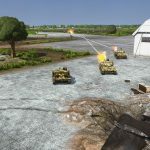 Hence you’ll be able to mix a little bit of plenty of different things, from Panzer 35R(f) & Panzer 39H(f) to Tiger or Panther, from rookie PaK 37mm to elite Jagdpanzer IV. FGP’s fighter cover is provided by some of the Paris defense squadrons using captured French D.520, while it can count on the MASSIVE support from Ju-188 bombers to level Paris to the ground if need be. 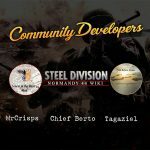 its recon tab features a few SPW204(f) (Panhard) armored car, both with or without turret, the latter being used as scout APC. A lone Phase C Beo.Storch provides observation for the off-map Karl Gerät super-heavy howitzer, firing only one 600mm shell per “volley”. 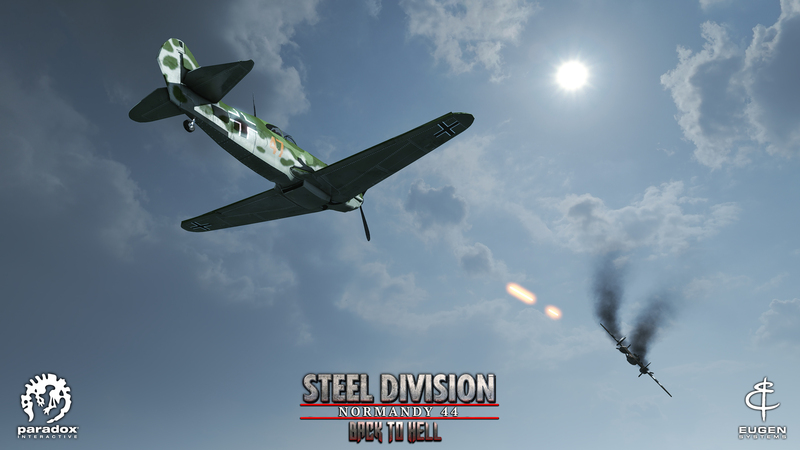 Steel Division: Normandy 44 – Back to Hell will be available today.